Posted on December 13, 2009	by Lou Murray, Ph.D.
We just had four days of rain, but today the sun is shining again. I snapped these pics earlier in the week, just before the series of storms rolled in off the Pacific. Spinach, cheddar cauliflower, and red and yellow onion sets are up also, but the purple cauliflower crop is a bust. No sprouts. These are all in raised bed #3. 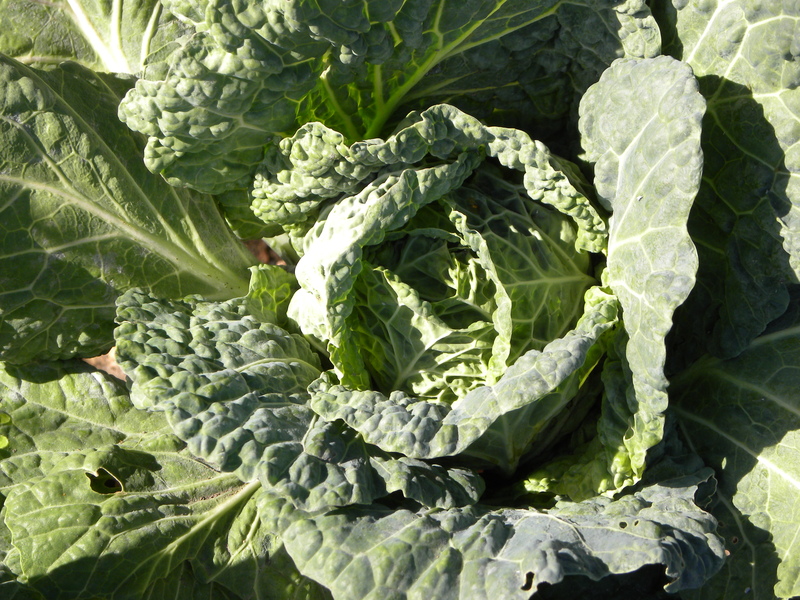 Raised bed #2 is still magnificient with chard, lettuce, spinach, leeks, red and savoy cabbage, and cauliflower. I’m playing a waiting game with my first head of cauliflower to see how big it will get before I harvest it. I think what this means is that I’m setting myself up to harvest it just a hair before it bolts or flowers out or whatever the heck it is that a head of cauliflower will do. Bed #1 continues to produce bell peppers. We’ve tried for years to grow bell peppers with no success. They were always thin-skinned and bitter. This year we’re getting perfect bell peppers. I sprayed the plants with blossom set (a plant hormone) early in the season and again in the fall. I don’t know if that is the difference, or the type I planted. I got a 6-pack of mixed color peppers from Lowe’s and they’ve produced peppers all summer and are still going strong. I have about 20 more coming along in various stages of growth. Winter is time for citrus in our neck of the woods. We have navel oranges, Eureka and Meyer lemons, and Bearrs limes ready for harvest. The valencia oranges will ripen later in the season. Fruit trees grow all along our back fence. Here are Fuji, Gala, and Granny Smith apple trees, plus a Florida Prince peach and a Santa Rosa plum. We have about 20 fruit trees, some in the ground and some in pots, in my urban orchard. Some are dwarf, some semi-dwarf, and some are full-sized. The apple and stone fruit trees still have most of their leaves, but they’ll fall soon. I have some bird feeders here, and you can see the chicken coop (still no chickens! I’m such a procrastinator) in the background. I grew vegetables here a couple of years ago, but the trees cast too much shade now for anything except lettuce. I do some container gardening in front, where there is more sun. I grow green onions year round in these terra cotta bowls, planting them from seed. Baby bok choy also does nicely in these bowls, but it’s a cool weather crop only. Once the bok choy is eaten, this bowl will revert to green onion production. I use the potting soil over and over, just adding Sure Start organic fertilizer prior to each planting. The rhubarb plant is coming along nicely. Each leaf that sprouts is bigger than the one before. This is the first year in the garden for this plant, and I’m supposed to let it grow all year without harvesting so the root can get big and strong. But I can never wait. By February or March, I may harvest a few stems to put into a coffee cake. That’s the only way I like to eat rhubarb. I really only wanted a couple of artichoke plants, so I bought two of them, thinking that my perennial artichokes had completey died. Turned out that they were just dormant. Then it turned out that the pots that I bought had two artichokes each. Then, inexplicably, I bought another pot of artichokes. I’ve ended up with eight artichoke plants, more than I really intended. Oh well, I like artichokes. See all that lush growth around the artichokes? They’re mostly weeds. Somewhere hidden in those weeds are about 30 red onions that I planted from sets around the artichokes. I’ve not tried onions in this bed before. This plot gets precious little sun in the winter, as the neighbor’s trees to the south shade it pretty completely. Now that I have a break in the rain, I need to get to work on those weeds and see if I can find the onions. I think I’ll name my garden by the front sidewalk the Garden of Infinite Neglect. Since I got my lovely raised beds in back from Gardener’s Supply Company, I’ve pretty much ignored it. Yet it continues to provide us with kale and collards. If I bothered to harvest them, there are eggplants and beets ready as well. There is always more to do in a southern California garden. It never sleeps. 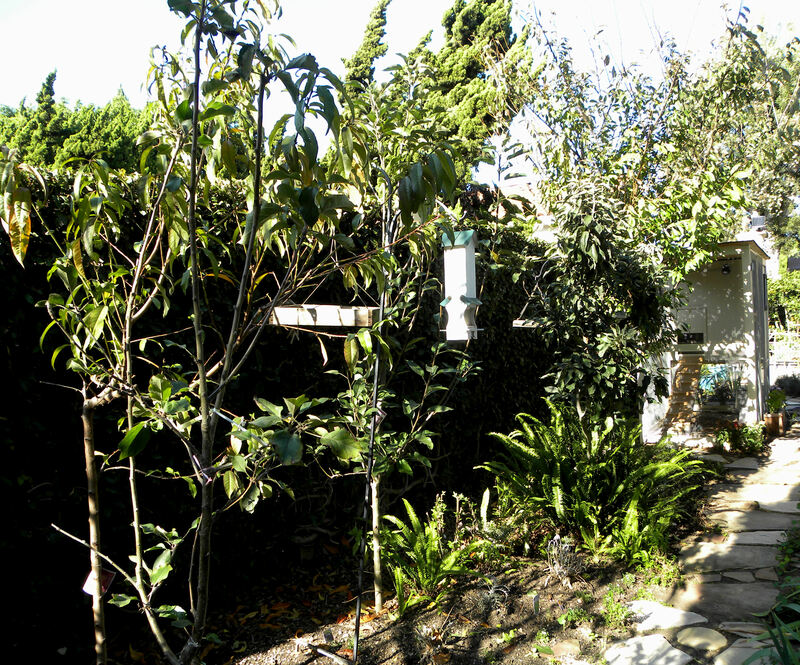 This entry was posted in Uncategorized and tagged apple trees, artichokes, bok choy, citrus trees, collards, garden, Gardener's Supply Company, gardening in containers, green onions, kale, lettuce, radish, southern California, stone fruit trees, sugar snap peas, urban orchard, vegetables. Bookmark the permalink. I love your gardens! I think I have a sister Garden of Infinite Neglect here in Indiana. Timing the cauliflower is always touchy at best. I try and err on the side of caution and pick it before it gets full size, but sometimes “it” has other ideas. Good luck with yours. Thanks, Villager. I suspect that there are Gardens of Infinite Neglect all over the place, as well as Gardens of Perpetual Responsibility. How lucky am I to have one of each? I know just what you mean, it doesn’t take long for a garden of responsibility to transform into neglect. Love the pics here though, beautiful work. Hi Lou…I just subscribed to your blog and am enjoying your posts very much. So good to find one like yours right here in So. Cal. My garden is just a stone’s throw in Santa Monica. Thanks, Sharon. What are you growing? I grow pretty much everything from seed. I’ve got a variety of lettuce, rutabagas, parsnips, beets, carrots, fino fennel, leeks, shallots, garlic, cool weather greens, etc. Whew! I just pulled up a Juliette grape tomato plant today. It had lot’s of green tomatoes on it but with the cooler weather coming (eventually) I’m going to use the space for brocoli, cauliflower, etc. I’m in a community garden and do have a decent size plot. Oh yeah Lou, flowers and bulbs too! Hi Sharon, how nice to have a community garden plot. We hope to get a community garden going in Huntington Beach soon. I’ve never tried growing shallots, but would like to. Do you grow them from seed too? Hi Lou…I usually buy shallot and garlic bulbs (at any nursery, not the market) the same time, usually late Oct., Nov. I just break up the cloves and plant them the same way. So easy! I have waited too long on the cauliflower and wound up with a nasty, rice-y looking thing. It was awful! I love your vegetable garden, especially the artichokes. I love to grow cardoon and artichokes, but just to look at. I don’t eat them. Other people are glad to eat them for me. Usually. Hi Janie, hope your snow has melted by now. You and Villager are scaring me about my cauliflower. I think I’ll pick it tomorrow. I almost picked it today, but we opted for turkey soup for dinner instead. I have never tried rhubarb – to eat or to grow… I guess it takes a lot of space in the garden? 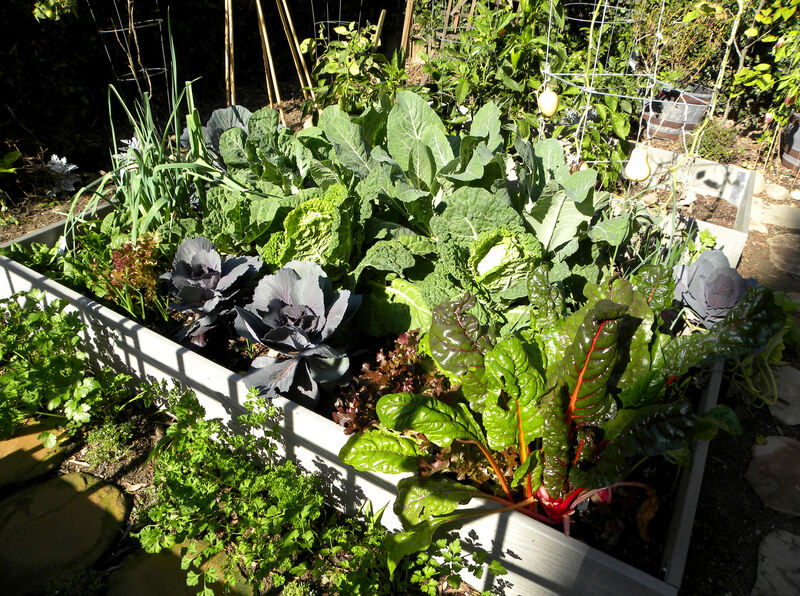 That picture of raised bed is just lovely – some of those veggies I will not see in my garden for another 6 months. I love how you grow your green onions – this is great idea. Does it take longer to grow them from seeds? Hi Vrtlaricaana, no rhubarb doesn’t take up too much space, about as much as a tomato, less than a summer squash. Most people cook it with strawberries in a pie, but I hate it that way. The leaves are high in oxalic acid, and therefore poisonous, so if you try it, use only the red stalk. It’s really easy to grow green bunching onions from seed. They take about 3-6 weeks longer than growing them from potted transplants. They don’t grow from sets like bulb onions. I haven’t tried growing bulb onions from seed before, but I may do so this year since I have some seeds for cippolino onions.